Moving sustainable-design towards greater commercial feasibility Commercial Green is promoted by multi-disciplinary engineers Gifford. Applying existing sustainability standards in a coherent ‘one stop shop’ way. Natural Step is addressing the tendency to ignore the current environmental issues until they reach crisis point. Which manifests itself as the industry continuing to use materials and methods which will result in less choice as time progresses, until we reach the point where there is no longer a choice, to avoid oblivion the most draconian methods will have to be adopted, until the planet can recover. BREEAM, Building Research Establishment Environmental Assessment Method for Offices, Retail warehouses, Industrial, Retail developments, Schools. Apply principle to all buildings in the absence of a formal scheme, develop bespoke solutions and give something back to the industry. Since an EcoHomes ‘Pass’ can be achieved for no financial outlay and is easy to achieve what is its purpose, always aim for ‘Excellent’ or higher. Choice of materials to achieve EcoHomes rating is on an ABC scale A being the best, but it only classifies the greener end of conventional materials available and the scope does not address many sustainable, renewable, natural, recycled materials, yet. Greenwich Millennium Village housing flat layouts, slide away acoustic walls, between bedrooms and living rooms, fold up beds into wardrobes, allow opening up of the house during the day. The plan also allows the family to grow to have one then two bedrooms, then one bedroom again, the bedoom that is not required to be a bedroom can become a work room or just more living space. The flat plan can also become 3 bedrooms and one living/kitchen/dining room in a flat-share arrangement. BRE’s Integer House has partitions between two bedrooms hung on tracks to allow lateral movement to change room sizes, the partitions can also swivel in vertical axis to allow ways through between rooms. BedZED services run behind hollow skirting, dado, movement joint covers, etc. Flush threshold front and rear. Building Regulations Approved Document M (BRAD M) Entrances, doors, halls, rooms, toilets, bathrooms, kitchens, electrics, gardens. Design for location as much as the building brief, avoid over design. less solvent based paints, but be careful low VOC paints can have harmful chemicals added to ensure performance of water based paint is similar to solvent based. 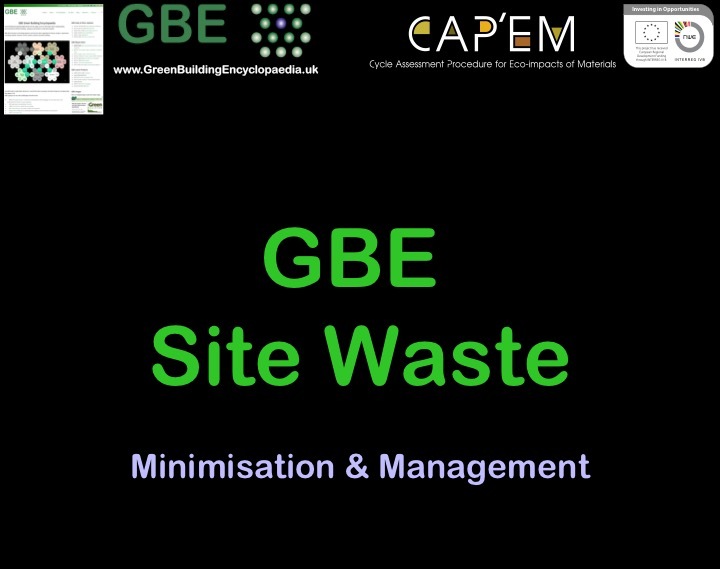 Consider the significant issue of waste generated and need to divert from landfill. Work with the Local Employment Office to set up recruitment office at site boundary on larger projects. Maximise the use of local/regional materials and products used on the project. Aim to make the site autonomous in respect of materials, especially in respect of landscape materials and to a lesser extend building materials. Purchase local materials to minimise transport costs and emissions. Adopt wireless networks with caution since radiation from mobile phones is an issues the same may apply to wireless networks which are often left on all the time 24 hours a day 356 days a year. Greenwich Millennium Village adopted 1956 Parker Morris Standards for Housing (set minimum space standards for house, room and storage floor areas); included moveable internal walls – reduces need for extensions, improves quality of life. Does one exist, or could developing one be part of the unique value of the project? with or without waterproof membrane below sub bases. On-site temporary factory production, aiming for factory conditions and better quality work and less waste. benefits: less vehicles to deliver materials. Set up on-site factory production under weatherproof enclosure on solid base and thermally comfortable conditions, insulated to avoid wasting heat. A good incentive to start taking rail freight and canals more seriously. Use local materials, manufacturers, suppliers and sub-contractors where possible, to reduce travel. Contractor’s staff and Sub-contractors travel daily from base unless using local accommodation, potentially a bigger impact than materials transport travelling once. The internet has the potential to address this issue in the UK. fuel used in bus, for non-local items delivery by rail?